EYG is delighted to be presenting the Public Service Award at tomorrow’s Hull Daily Mail Heart Awards, recognising the wonderful achievements of inspirational local heroes. As past winners of the Business in the Community Award for our support of many local charities and good causes, we decided to support the event this year by sponsoring an award which recognises people in public service who go the extra mile to help others. 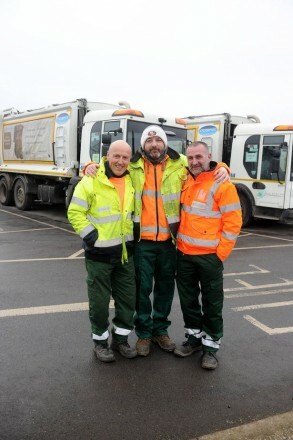 Finalists on the night include Hedon binmen Richard Gaukroger, Ben Crawford and Steve Thirsk, who helped stop an armed carjacker earlier this year. After University of Hull manager Barry Storey had been ordered out of his silver Lexus by the carjacker, who was holding a pistol, the three-man waste collection crew used their lorry to block in the Lexus and stop the criminal – actions that quite rightly brought much praise, and their shortlisting for tomorrow night. PC 219 Catherine Shann has also made the shortlist after springing into work mode when tragedy struck as she was running the Hell on the Humber race, dressed in fancy dress. When someone sadly took their own life on the Humber Bridge, PC Shann, a response officer with nearly 11 years’ service, immediately took matters into her own hands. She handled the situation on her own for a while, securing witnesses and enlisting her brother and partner to assist in directing traffic. Having contacted the force to raise a log and get further assistance, PC Shann still managed to run 26 miles and raise money for charity. Third finalist tomorrow is critical care outreach nurse at Hull Royal Infirmary Alison Carllil, who was nominated by the mother of one of her patients. The nominator’s mum was rushed to hospital after suffering a huge blood clot on both lungs and was in a critical condition. Although all staff were said to be “fantastic”, the nominee said it was only when Ms Carllil turned up for her shift that things started to take a turn for the better. Nick Ward, joint managing director of EYG, said: "As a proud East Yorkshire company, established in Hull more than 45 years ago, we are passionate about supporting local charities, good causes and events which celebrate all that is good about our region. "It was for that reason that we were winners of a Heart Award ourselves last year in recognition of our commitment to supporting the community. “Last year’s awards were so inspirational that we wanted to be involved again and we are delighted to be supporting the Public Services Heart award, recognising those who go the extra mile for the benefit of the community. "All three finalists fully deserve the recognition of being shortlisted for tomorrow night’s awards ceremony.